Under the CCBA flag – one family from across the seas. Honorary President Geoffrey Lau and the directors newly sworn into office. Lau supervised the event. Master of Ceremony Mr. Yue Hua and Miss Yeung Yi Man brought much liveliness to the night. 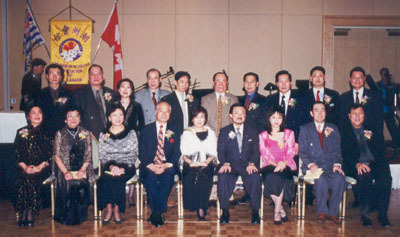 Guest, current President Po-Chu Lee (front, 2nd from the right), last President David W. Choi (front, 1st from the right), S.U.C.C.E.S.S. CEO Lillian To, Vice President Stephen Li (back, 1st from the left) and , City Councillors Daniel Chiu and See-Yuen Lee. (Left to right) Front: Mr. and Mrs. Patrick Wong MLA, Wu Jun-Yi Overseas Chinese Liaison Consulate, President Po-Chu Lee, M Sophia Leung M.P., Mr. and Mrs. Richard T Lee MLA. (Back) Vice President Paul Lo, Honorary President On-Tak Cheung, City Councillor Mr. and Mrs. Lee Chung, and guest.